European 1500m finalists Jake Wightman and Sarah McDonald won the 800m races in the 100th BMC meeting in respective times of 1:49.18 and 2:04.13. Another member of the Amsterdam team, Tom Lancashire, won the 1500m in 3:44.80. Alison Leonard, who was disappointed not to get selected for the Rio 800m, won the 1500 metres in 4:13.77. 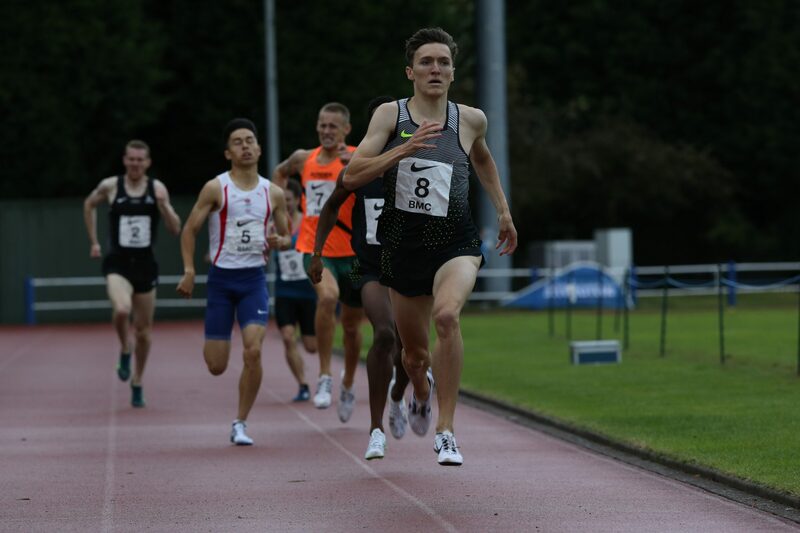 Lauren Howarth won the 5000m in torrential rain in a 15:44.28 PB while Adam Hickey won the 10,000m in 29:51.64, having already finished third in the men’s 3000m. A full report from Kevin Fahey and photographs from Dave Greenwood will appear in this week’s AW. Joel McFarlane (6260) and Jade O’Dowda (5010) won the Under-17 Championships while Aran Thomas (4116) and Jess Hopkins (3769) won the under-15 gold medals. A report plus photographs from David Griffiths will appear in this week’s issue. Nicole Kendall won the women’s 400m in 54.85. Jack Martin won in a time of 32:15 while Kirsty Longley won the women’s race in 36:52. Joe Wade won a tough race in 72:20. Roseanna Andrews was first woman in 86:36. Joel Fearon continued his sensational form with a 10.00 100m victory and Reece Prescod won the 200m in 20.57. World junior 10km champion Callum Wilkinson won the 3000m walk in 11:49.85. Under-17 Katy-Ann McDonald won the women’s 800m in a PB of 2:05.03. Trevor Baxter’s report plus David Greenwood’s photographs will appear in this week’s issue. European junior champion Kyle Langford won the men’s 800m in 1:48.94 while Adele Tracey won the women’s race in 2:01.26 ahead of Katie Snowden’s 2:02.31.